Some of Canada's top financial minds have warned that Canadians have been adding too much debt to the household balance sheets over the past few years. Now, a new report from Statistics Canada shows just how much debt we already had when the cheap money taps were opened. StatsCan released a major report Friday that outlines the overall debt situation of Canadians as of 2009. It only measured what is owed by Canadians who carry any form of debt, not those that are debt free. According to the report, the typical borrower owes on average of $114,400. However, that number that is almost certainly higher today due to persistently low interest rates, and more worrisome could be that two-thirds of all Canadians who carry debt owe more than the average. The Bank of Canada has kept its key lending rate at one per cent since early 2008, the longest period of unchanged rates since the 1950s. The report makes clear how different segments of Canadian society have taken on debt, depending on their geographic location, income, and education levels. Despite having some of the most expensive housing markets in the country, residents of British Columbia only had the second highest debt levels, averaging $155,500. Canada's most indebted citizens are in Alberta, where the typical borrower owes $157,700. The least indebted Canadians lives in the Atlantic region and Quebec, with average debts of $69,300 and $78,900 respectively. Statistics Canada says much of the average debt levels in each region can be explained by local housing prices and income levels. While British Columbia has seen home prices skyrocket over the past few years, Alberta has seen income levels rise due to expansion in the oilsands. Because mortgage debt is often the largest amount an individual will ever owe, it is no surprise that Canadians with mortgages have the highest debts. Homeowners still carrying mortgages owe an average of $161,200 in all forms of debt. That represents 82 per cent of all outstanding debt in the country. Conversely, renters in Canada owe significantly less with an average of just $36,200. Canadians that attended post-secondary education were more likely to carry heavy debt burdens as well. The average university graduate in Canada who owes money has a debt burden of $145,400, while Canadians who attended post-secondary education somewhere other than a university owes $114,300. The typical borrower who did not attend post-secondary education owes $90,900, or nearly $25,000 under the national average. Not surprisingly, Canadians typically carried less debt as they aged, largely due to paid-off mortgages, children who were no longer dependant, and decades of financial planning. Canadians under the age of 45 make up just 45% of the population, but carry 54% of all debt, and on average owe $129,200. Individuals aged between 45 and 64 owe $102,800 on average, while Canadians over 65 hold the least debt with an average of $66,000. 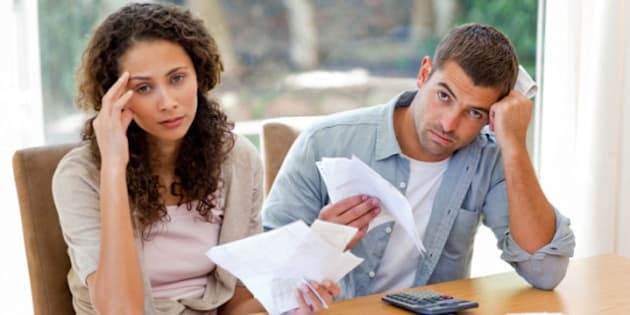 Married couples with children not surprisingly have higher debt levels than the average Canadian. They on average owe $144,600. By way of comparison, unattached individuals without children owe less than half their married counterparts. Statistics Canada points to a direct correlation between having children and carrying debt. While unattached individuals with debt owe on average $63,200, single parent debt loads are substantially higher at $100,800. Higher income levels also directly correlated with higher average debt loads. Canadians with a household income over $100,000 per year had the highest debts in the country, with an average of $172,400. Conversely, those earning under $50,000 had debts averaging $57,700. The amount of self-assessed financial knowledge also played a role in how much Canadians owed. Individuals that said they were "very knowledgeable" about financial matters averaged $29,000 more debt than those stating they were "not very knowledgeable". Which Parts Of Canada Have The Highest Household Debt?